A state is an organized political community acting under a government. States differ in sovereignty, governance, geography, and interests. Federated states differ from sovereign states in that they have transferred a portion of their sovereign powers to a federal government. Under the rule of law, no one person can rule and even top government officials are bound by the law. The “nation” refers to a large geographical area and the people living there who perceive themselves as having a common identity. The nation state is a state that self-identifies as deriving its political legitimacy from serving as a sovereign entity for a nation as a sovereign territorial unit. Civil society is the arena outside of the family, the state, and the market where people associate to advance common interests. civil society: All of the institutions, voluntary organizations, and corporate bodies that are less than the state but greater than the family. Sovereign states: A sovereign state is a political organization with a centralized government that has supreme independent authority over a geographic area. States may be classified as sovereign if they are not dependent on, or subject to, any other power or state. Other states are subject to external sovereignty or hegemony where ultimate sovereignty lies in another state. A federated state is a territorial and constitutional community forming part of a federation. Such states differ from sovereign states, in that they have transferred a portion of their sovereign powers to a federal government. The concept of the state is different from the concept of government. A government is the particular group of people that controls the state apparatus at a given time. In other words, governments are the means through which state power is employed; for example, by applying the rule of law. The rule of law is a legal maxim whereby governmental decisions are made by applying known legal principles. The rule of law is rule not by one person, as in an absolute monarchy, but by laws, as in a democratic republic; no one person can rule and even top government officials are under and ruled by the law. The concept of the state is also different from the concept of a nation, which refers to a large geographical area, and the people therein who perceive themselves as having a common identity. The state is a political and geopolitical entity; the nation is a cultural or ethnic entity. The nation state is a state that self-identifies as deriving its political legitimacy from serving as a sovereign entity for a nation as a sovereign territorial unit. The term nation state implies that the two geographically coincide. In classical thought, the state was identified with political society and civil society as a form of political community. In contrast, modern thought distinguishes the nation state as a political society from civil society as a form of economic society. Civil society is the arena outside of the family, the state, and the market where people associate to advance common interests. It is sometimes considered to include the family and the private sphere and then referred to as the third sector of society, distinct from government and business. Heads of State: In the United States, the state is governed by a government headed by an elected president. Pictured here are, from left to right, Presidents George H.W. 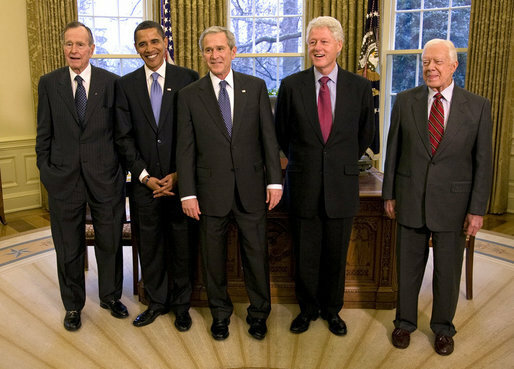 Bush, Barack Obama, George W. Bush, Bill Clinton, and Jimmy Carter.